Herman Hiddema: I have removed one white stone from the position (at a). 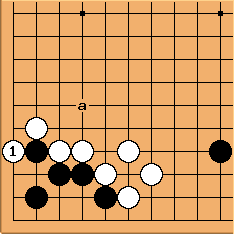 white has just played , hoping to play ko for the corner. Can black live? The shape is similar to Gokyo Shumyo Section 1 Problem 12.